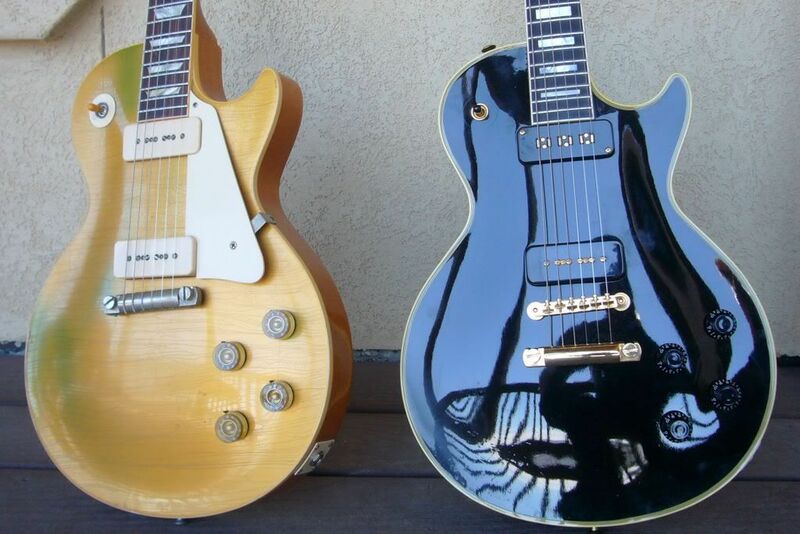 I Am Jonesing For a Les Paul Custom w/Bigsby! Discussion in 'Guitars in General' started by dhdfoster, May 8, 2008. I'm not really a Les Paul player. I owned a late 60s Custom for a few years, but just didn't love it. However, in my last band, the bass player used to let me play his CS 54 Goldtop. The tone of the P90s was great, and I loved the weight and neck angle of that guitar. 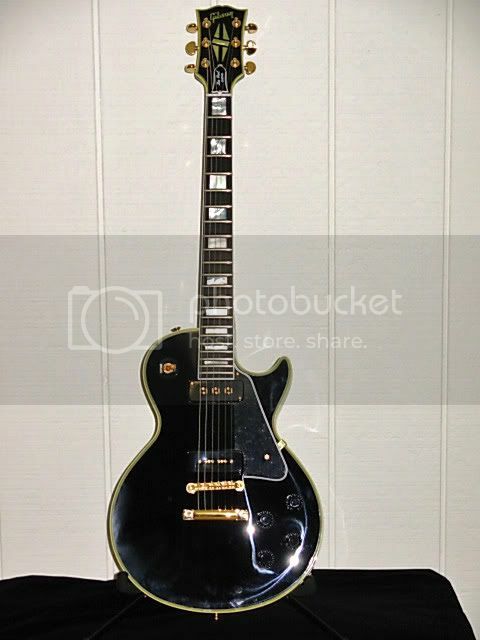 Anyway, lately I've really been lusting after a black Custom with a P90, Staple neck pup, and a Bigsby. I think it's the '56 Custom. Original is out of the question because of cost. Is Gibson still making these in the Historic division? Are they a small fortune? Anyone have any pics? Dude, you're in luck. Limited edition 54 Custom is available with a Bigsby. Good luck finding one. It'll be $4500 I bet. Thanks! Time to hit the Coin Star. You know, I love those, too. But I hope you're working out cause those mf'ers are heavy. Know what I'm sayin'? Paid $2700.00 for mine, sans Bigsby. Mine is a stop tail and it's not relatively heavy. I don't know how much weight the Bigsby adds. that it's a love it or hate it thing. I never played one. Mine is a stop tail and it's not relatively heavy. I don't know how much weight the Bigsby adds. I think they Bigsby looks cool as heck. When I searched TGP and the LPF for "Bigsby" I comprehended that it's a love it or hate it thing. I never played one. My god those guitars look cool...! Weasel, where did you get yours at such a good price? Edwards 54' Custom (P90s) + aftermarket Bigsby is what I did, total price <$1000. You can buy the staple pup from Duncan. Won't say Gibson on the headstock, but you'd have a really nice playing (and looking!) guitar for about $3000 cheaper. I just gave one away for $2500 in the emporium last month...great tone but weighed about 12 lbs..I wonder what Lollars or Wolfetones would've sounded like in it? Thanks for all the info! Beautiful guitars Jim S.
I can't believe I'm saying this, but I'd really want to get a real Gibson instead of an Edwards. I don't know why, as my other guitars are a no-name, homemade Tele and Gretsch Electromatic. I usually don't care about brands, but for this, I'd want the real deal. Maybe someday. I've seen some pretty slick replicas recently. That could be another option to have one built.